On Thursday, the most awaited movie of the year “3 idiots” was released. I had liked Chetan Bhagat’s “Five Point Someone”,when I read it in Engineering Final Year, but somehow, after reading “One night at call center”, I didn’t want to read another one by this writer. I would not have had high expectations from the Bollywood adaptation of FPS, but Hirani and Aamir’s names made sure that I was eagerly waiting for this movie. So I made use of the vacation time and went for the movie right on the day of its release. FPS: Yes, “3 idiots” is loosely based on FPS. But very, very loosely. Except for a few sequences, Hirani could have just made the movie w/o crediting Bhagat (not that I am suggesting this) and it could have gone almost unnoticed. Which one is better? FPS covers college-life in more details, but overall, 3i is much better. Aamir’s earlier movies: A story of friends automatically brings comparisons with DCH and RDB, while attacking the education-system and parents’ attitude makes you recall TZP (in parts). But, a comparison with any of these three isn’t good for any movie. 3i doesn’t even come close. Munnabhai series: No, the comparison is not just because of Hirani-Vidhu combo. It is the right combination of message, emotions and comedy that the movie shares with Munnabhai –I & II. But, on all three elements, I’d rate 3i lower than at least Munnabhai-I. But still, “3 idiots” is certainly one of the best movies released in 2009. Especially, if you have ever lived a hostel-life (specifically, an engineering college hostel life), you can easily relate to many things. The ragging scene ( I was lucky to escape most of that), millimeter (We had an equivalent “Chhotu” in our hostel), the technically-named pups: kilobyte, Gigabyte (We had “Floppy”!!) the no-change attitude of most professors: all this and more reminded me of my days at MNNIT. I also liked the jabs that the movie took at our education-system, the rat-race mentality and “What will the neighbors say?” attitude of the parents. I hope that movies like this one and TZP make parents think twice before forcing their wishes on their kids. The acting is top class: Aamir is beyond any comments, but even Madhwan and Sharman were flawless. And like in all his other movies, Hirani plays at will with the audience emotions: making us cry and laugh whenever he wants. And the last complaint that I have with the movie is the same one that I had from the book: I think that Raju’s background (Alok’s in FPS) could have been treated with more dignity. I think that there is a big section from the Indian lower middle class, for which good education of one of the kids, serves as the way out to resolve the family’s financial worries. Hirani could have avoided making fun of this segment at every possible opportunity. It made me laugh at times, but still, somewhere it pinched. BTW, this review would be incomplete without commenting on the music. I think that standalone, the music could have been classified as “nothing great!”, but the way the songs fit in with the story, makes them more powerful. I can easily imagine “Aal is well! !” to be a college-anthem these days all over India. “Zoobi doobi” looked a bit out of place in the movie, while “Badal Awara” was likable to listen to (Somehow, the music appeared to be familiar; is it “inspired” by some other Hindi song?) Even if you don’t like the song for the music or lyrics, you’ll certainly like it for the beautiful visuals of the Himachal. The song that I liked best in the movie was “Give me some sunshine! !” It’s difficult not to be moved by the lyrics. Specifically, the lines “Give me some sunshine, Give me some rain, Give me another chance, I wanna grow up once again! !” are just too good. But surprisingly , the song that was echoing in my mind when I woke up the next day, was the one which I didn’t notice that I liked that much in the movie: “Jaane nahin denge tujhe!”. I don’t remember such an intense song from Sonu Nigam, since “Tanhayee! !” (which, BTW, is one of my all time favs). I have been listening to these two on repeat mode since I came back from the movie. BTW, after listening to the lyrics of all the songs, I was almost sure that this is Prasoon Joshi’s work. (Did anyone else feel the same way?) Anyways, good work by Swanand Kirkire..
Well, as I look back at what I have written, it seems I have written more negatives than positives. This doesn’t mean that I didn’t like the movie. On the contrary, I really liked it, but wanted to point out a few issues that I had with the movie. (And I know that not many share my viewpoint.) I could have easily ignored these, but we expect perfection from every Aamir Khan movie and as he himself said in DCH: “Perfection ko improve karna mushkil hota hai”. Ignoring these minor negatives, I really enjoyed the movie. Much more than what my complaints above suggest!! 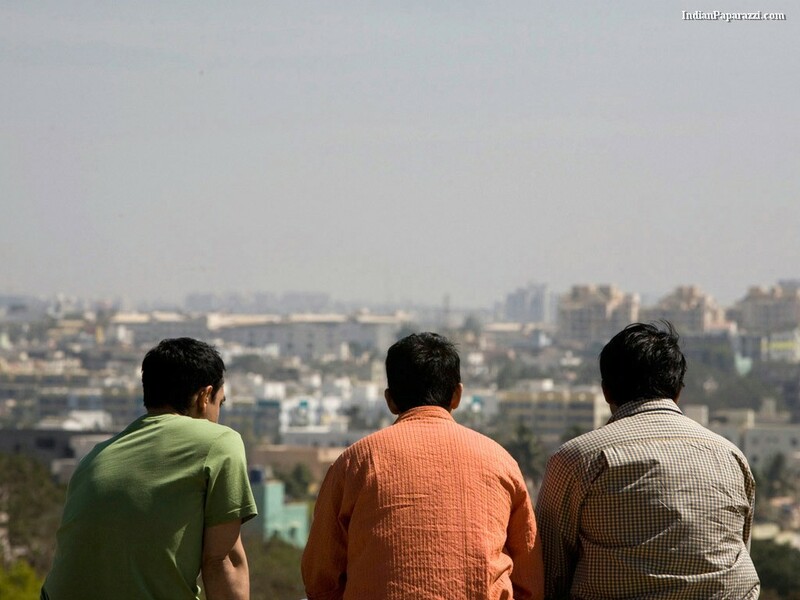 5 Comments on 3 idiots: Entertaining, nostalgic, emotional, but not perfect.. OMG!! I never thought that I will find anybody else, who felt insulted by the jokes at Raju’s family. They could have presented more tastefully. My views are different on music. I loved Zoobi doobi and did not like jaane nahin denge at all. I also saw it on the very first day of its release, loaded with high expectation from Amir khan and his perfectionist approach. No doubt a very good movie but got disappointed at least on perfection front. Some of the scenes copied from old adv videos which he could have done without. Most shocking for me was that I didnt like Amir’s acting in the movie (Dont know whether it was due to high expectations frm him). Sharman and Boman stole the show. Abt Rancho going on to top every exam can be justified because of the fact that he was not doing it for himself but for the contract with Mr. Chanchad. People like Rancho will not WANT to top but they CAN in the current edu system. hey it’s a very nice yaar i like it……..